There shall be an Office of Emergency Management headed by a Director of Emergency Management. The Office of Emergency Management shall be responsible for providing planning, coordination and domestic preparedness training and shall coordinate the Town’s emergency management effort with Federal, State and local jurisdictions/partners. The Office of Emergency Management shall also be responsible for management of an integrated public safety system, as well as all other responsibilities as described in the intent of subtitle. The head of the Office of Emergency Management shall be appointed by the Town Mayor and act under his/her authority. The head of the Office of Emergency Management shall be the Fire Chief of the Morningside Volunteer Fire Department or his/her designee. (1) The intent of this Subtitle is to provide for the preparation and execution of plans for the mitigation of, preparation for, response to and recovery from disasters and major emergencies for the emergency management of persons and property within the Town in the event of an enemy attack, sabotage or other hostile action, or from fire, flood, earthquake, hurricane, or other natural causes, and to provide for the coordination of the emergency management functions of the Town with all public agencies and their various departments, with other Counties, cities and political subdivisions, and with private agencies, organizations, persons and corporations of every type to insure the complete and efficient utilization of all facilities available to combat any disaster or emergency. (2) The Office of Emergency Management created by this Subtitle shall be the coordinating agency for all activity of the emergency management program, and during a period of attack, terrorist act or natural disaster it will act as the instrument through which the Town Mayor may exercise the authority and discharge the responsibilities vested in him by this Subtitle. (3) This Subtitle shall not relieve any Town department of the normal responsibilities of authority ascribed to it, nor will it adversely affect the work of the American Red Cross or other volunteer agencies dedicated to disaster relief activities. (1) Attack shall mean a direct assault against the Town by the forces of a hostile nation or the agents thereof, including assault by bombing, chemical or biological warfare, terrorist act or sabotage as well as acts of domestic terrorism. (2) Curfew shall mean a prohibition against a person walking, running, standing or motoring upon any alley, street, highway, public property or vacant premises within the County, excepting persons officially designated to duty relating to the civil emergency and those persons who are in public places by reason of their employment or a private emergency involving health, safety or protection of property. (3) Director shall mean the Director of the Office of Emergency Management, as executive head of the Office of Emergency Management, or a Deputy Director duly appointed and acting for the Director in accordance with the provisions of this Subtitle. (A) An act of civil unrest or unlawful assembly characterized by the use of actual force or violence or a threat to use force if accompanied by immediate power to execute by two (2) or more persons acting together without authority of law. (B) Any man-made calamity within the Town resulting in the death or injury of persons or the destruction of property to such an extent that extraordinary measures must be taken to protect the public health, safety and welfare. (C) Natural disasters, as defined below. (5) Emergency management shall mean the preparation for and the carrying out of all emergency functions, other than functions for which military forces or other Federal agencies are primarily responsible, to prevent, minimize and repair injury and damage resulting from disasters caused by enemy attack, sabotage or other hostile action, or by fire, flood or other causes. These functions include, but are not limited to, firefighting services, police services, medical and health services, communications, radiological, chemical and other special weapons defense, evacuation of persons from stricken areas, emergency welfare service, civilian aid service, emergency transportation, plant protection, temporary restoration of public utility services, and other functions related to civilian protection, together with all other activities necessary or incidental to the preparation for carrying out of the foregoing functions. (6) Emergency management forces shall mean the employees, equipment and facilities of all Town departments, boards, institutions and commissions suitable for, or adaptable to, emergency management activity and designated by the Town Mayor to participate in the emergency management activity. In addition, it shall include all volunteer personnel, equipment and facilities contributed by, or obtained from volunteer persons or agencies. (7) Emergency management volunteer shall mean any person duly registered and appointed by the Director and assigned to participate in the emergency management activity. (8) Natural disaster shall mean any condition seriously affecting or threatening public health, welfare or security as a result of severe fire, explosion, flood, tornado, hurricane or similar natural or accidental cause and which is beyond the control of public or private agencies ordinarily responsible for the control or relief of such conditions. This does not include riots, strikes, insurrection or civil disturbances. (9) Volunteer shall mean contributing service, equipment or facilities to the Office of Emergency Management without remuneration or without formal agreement or contract of hire. (1) The Town may exercise the emergency power and authority as specified in this Subtitle. During any period of attack or emergency in the Town, and thereafter so long as the Town deems it necessary. Regulations designed to lessen the hazards to property and citizens from attack or emergency. (4) The Town Mayor shall order emergency management forces to the aid of other communities in accordance with the Statutes of the State. The Town Mayor may request the State, or political subdivisions of the State, to send aid to the Town in case of natural disaster or in case of disaster resulting from attack or emergency when conditions in the Town are beyond the control of the local emergency management forces. (5) When obtaining formal approval would result in delay of attack-relief activity, the Town Mayor may, until the Council convenes, waive procedures and formalities otherwise required pertaining to the performance of public works, entering into contracts, the incurring of obligations, the employment of temporary workers, the rental of equipment, the purchase and distribution of supplies, materials and facilities, and expenditures of existing funds. The Council is also empowered to waive any such procedures and formalities. (6) Whenever the Town Mayor finds that any condition in the Town has attained, or threatens to attain, the proportions of a natural disaster, the Town Mayor may assemble and utilize emergency management forces and may prescribe the manner and conditions of their use. The Town Mayor, when deemed in the public interest, may send emergency management forces of the Town to the aid of other communities stricken by natural disaster when such disaster is affecting the health, welfare or security of the stricken community; provided, that after the Town Council convenes, the further continuance of any such natural disaster relief and the period thereof, shall be subject to the action of the Town Council. (7) The Town Mayor may make regulations permitting the conduct of practice tests of the Emergency Management Organization. Such regulations shall be filed with the Town Council and shall be binding upon the emergency management forces. Nothing in this Subtitle shall be construed as power or authority to abridge or lessen the legislative and administrative powers of the Council, unless such is specifically granted in this Subtitle. No person shall have the right to bind the Town of Morningside by contract, agreement or otherwise, without prior and specific approval of the Town. In carrying out the provisions of this Subtitle, the Town Mayor is authorized to utilize the services, equipment, supplies and facilities of the existing departments, bureaus, offices, commissions, committees, authorities and agencies of the Town to the maximum extent practicable. The officers, agents, employees and personnel of all such departments, bureaus, offices, commissions, committees, authorities and agencies of the Town shall cooperate with and extend all services and facilities to the Town Mayor, the Office of Emergency Management and to the Director. 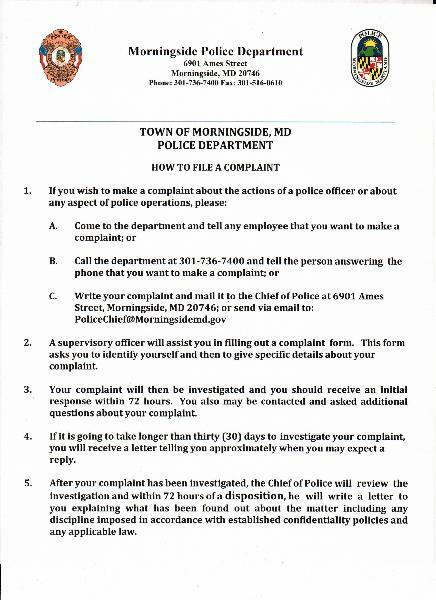 (1) Neither the Town nor any of its agencies, agents or representatives engaged in any emergency management activities, while complying with or attempting to comply with the rules and regulations promulgated pursuant to the provisions of this Subtitle, except in cases of willful misconduct, shall be liable for the death or injury to any person or damage to any property, as a result of such activity. (2) Any person owning or controlling real estate or other premises who voluntarily and without compensation grants the Town the right to inspect, designate and use the whole or any part of the premises or real estate for the purpose of sheltering persons during an actual, impending or practice enemy attack or natural disaster shall not be civilly liable for the death or injury to any person on or about the real estate or premises under license, privilege or other permission or for loss of or damage to property of such person. (3) The provisions of this Section shall not affect the right of any person to receive benefits to which he would otherwise be entitled to under this Subtitle, or under the Workmen's Compensation Law, or under any pension law, nor the right of any person to receive any benefits or compensations under any act of Congress. Whenever the Federal government or the State or any agency or officer thereof, or any person offers to the Town or to the Office of Emergency Management any services, equipment, supplies, materials or funds by way of gift, grant or loan for purposes of emergency management and disaster relief, the Town, acting through the Town Mayor may authorize any officer of the Town, or the Director or any Deputy Director of the Office of Emergency Management as the case may be, to receive such services, equipment, supplies, materials or funds on behalf of the Town, and subject to the terms of the offer and the rules and regulations, if any, of the agency making the offer. Such acceptance, however, shall not create any liability on the part of the Town, Office of Emergency Management or any officer, agent or employee thereof for failure to comply with the terms of such offer and the rules and regulations, if any, of the agency making the offer. (1) All emergency management and disaster relief functions of the Town shall be coordinated to the maximum extent possible with comparable functions of the State, Federal and local governments, including their various departments and agencies, and with private agencies of every type, to the end that the most effective preparation and use can be made of the Town’s manpower resources and facilities for dealing with any disaster or emergency that may occur. (2) The Director of the Office of Emergency Management may, subject to the approval of the Town Mayor and Towns Council, develop, cause to be developed, or enter into mutual aid agreements for reciprocal emergency management aid and assistance in case of a disaster too great to be dealt with unassisted. The agreements shall be consistent with the Washington Metropolitan Area and State emergency management plans and programs. In case of emergency it shall be the duty of each local organization for emergency management to render assistance in accordance with the mutual aid agreements. (3) The Director of the Office of Emergency Management may, subject to the approval of the Town Mayor, enter into mutual agreements with Emergency Management agencies or organizations in other States for reciprocal emergency aid and assistance in case of a disaster too great to be dealt with unassisted. No person shall display any identifying emergency management insignia for any purpose other than that for which it was intended, or under circumstances not authorized by the Director of the Office of Emergency Management. (1) No person shall wear or display in any manner any insignia, sign or device purported to be an emergency management insignia, except when such insignia has been duly issued by the Office of Emergency Management and is displayed in accordance with regulations established by the Director of the Office of Emergency Management. No person shall willfully obstruct, hinder or delay any member of the Office of Emergency Management in the enforcement of any rule or regulation issued pursuant to this Subtitle, or violate any of the rules or regulations issued pursuant to the authority contained in this Subtitle. The Police Department is authorized and directed to take any necessary action to make effective any order, rule or regulation promulgated under the authority conferred by this Subtitle.